The topic of bedroom colours is one that’s been studied in depth by psychologists. Even though we don’t see the colours when the lights are off and our eyes are closed, the colours we choose for our bedrooms still have an effect on us. Some are more relaxing than others and some colours even get us in the mood for intimacy. Let’s take a closer look at the best choices for paint colours in the bedroom. Studies have confirmed that blue is the best colour for sleep. Often considered a relaxing colour, it’s been shown that those who sleep in bedrooms painted blue get closer to their recommended eight hours of sleep and have a more restful nights sleep. The shade of blue isn’t as important matter as the brightness of the colour, for example, a vibrant blue may not be as soothing as pastel blue. The worst colour for any bedroom is a bright colour. Earth shades are next on the list for creating a relaxing bedroom that helps to stimulate sleep. Earthy hues tend to ground and relax us, which is why many spas and hotels favour colour palettes based on these tones. By combining a number of earth tones, you can create an elegant bedroom that is also conducive to sleep. It might not be the first colour that comes to mind, but orange can also help you to relax into sleep. Certain shades of orange can also have a soothing effect and can assist you in getting a good night’s sleep. Some shades of orange have been shown to relax muscles and help you fall into a sound sleep. You don’t want a bright or vibrant orange, but burnt orange can be a perfect colour for a bedroom. For those who prefer a home that is a little less colourful, silver-grey offers an option. But you’ll need to paint with some caution, as a room that is predominantly silver/grey can feel dreary and depressing. A feature wall of this colour may be better than grey walls throughout an entire room. Using a combination of colours can help you to create a bedroom that serves for both intimacy and sound sleep. 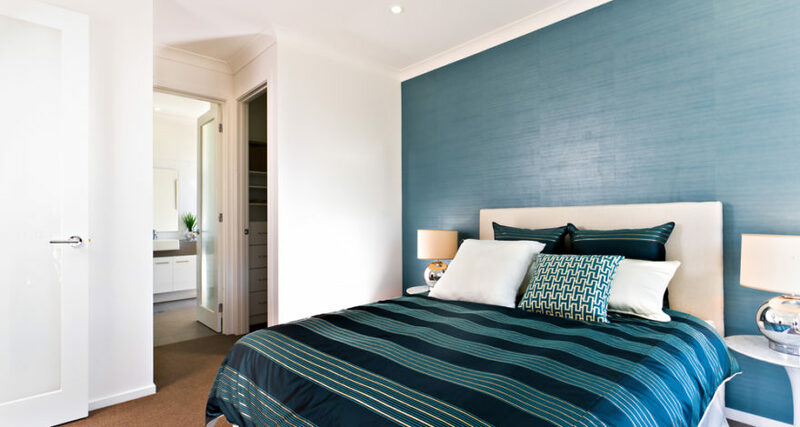 Orange or blue walls will help you sleep, whilst touches of black make a bedroom “sexier” without hampering sleep. Be sure to avoid too much black, grey or brown in any colour combination as a room can start to feel depressing or cluttered. Whether it’s for sleep or intimacy, try the colours above when you next paint your bedroom. One or a combination of these soothing colours can create the perfect relaxing oasis. For more inspiration or help with your next paint project, call or email us today at APMG Painting Melbourne.